If you’ve been working on a problem or project in Ruby, this is a great opportunity to talk about it. We looking for short (250-500 word) proposals outlining the content and target audience for your talk. Proposals will be accepted until Midnight (MST) on Dec 31st. Our selection committee will then review the proposals, select the primary and alternate presenters, and contact them in January of 2008. We’re looking for all sorts of Ruby and RoR related talks (and talks that aren’t strictly Ruby related but which would be of interest to rubyists). Talks will be 45 minutes in length, and should allow some time for audience questions. If you’d prefer something shorter, we’re hoping to run a lightning talk sessions on Friday and Saturday, with 8-10 five minute presentations each session—proposals are not required for lightning talks. Last year, we received a number of high quality proposals for talks at the 2007 MountainWest RubyConf. These talks made our regional conference a huge success. This year, we’re hoping to do even better but we’re going to need your help—please, propose a talk and plan on coming to enjoy this regional conference. Not quite as good as Ruby, but comparable or better than JRuby (interpreted and no special switched). I'm intrigued that the implied version looks better than the ternary or explicit (and in line with the system) though. In my post on SICP 1.1.6, there were a couple of questions raised about my Ruby code. Personally, I really hate the ternary if, I’ve always thought that it makes code harder to read. It’s probably still worth looking at though, since my biases are just that. Peter Cooper ... I was just intrigued as to why you wouldn’t use idiomatic Ruby, when SICP tends to use Scheme very idiomatically. This is another one of my failings, I’ve been doing enough non-Ruby stuff lately that I wasn’t thinking in it. Couple that with sitting down to ‘translate’ the code in separation from reading the text, and I was set to really mess up. Hopefully I can correct this going forward. It turns out that (at least in this case) the ternary form is the least performant. It’s probably no surprise that the built in version is the fastest. From now on, I’ll stick to using the built in abs. I’m going back to the idea of treating each langauge in a separate post. Hopefully this will make the comments a bit more manageable (especially since I cross posted the last one onto my erlang blog as well). There were several factor related comments on the last post that I wanted to address before I moved on to section 1.1.7. Anonymous Is Factor “done”? Seems like it’s still very much a work in progress. Can you comment on your choice of Factor and what has made it enjoyable for you? Anonymous is right, Factor isn’t done yet. It is getting close though, and for what I’m doing, it seems to be “done enough”. I’m using it because I’ve been thinking about learning a stack based language for a while, just to learn to think a little bit differently. So far, it’s fun because it’s doing just that. Ed Borasky Factor? What does Factor have that Forth doesn’t have? At least Forth has an ANS standard and some vendors and a few thousand person-decades of programmer experience. Ed, I think the big thing that drew me to Factor over Forth was an active Factor community that I sort of tripped over. Sometimes, it’s the squeaky wheel that draws a user. I agree that this is a much better way of solving the problem. I’m sure there are ways this could be improved yet further. Leave me a comment with your ideas. I’ll try to post my Ruby version tomorrow and Erlang on Thursday. With the publication of the first four chapters of their new book, “Ruby In Practice”, through the Manning Early Access Program (MEAP). Assaf Arkin and Jeremy McAnally have been kind enough to answer some questions about the book, Ruby, and themselves. You’re welcome to join our discussion here, or you can buy the book and join the Manning Forum for Ruby in Practice and discuss the book there. As the more of the book is published through MEAP, Assaf, Jeremy, and I will take some more opportunities to talk, so if you have questions you’d like to ask, please let me know. 1) It’s obvious that you guys are taking a different approach to writing about Ruby than most people (no Ruby Tutorial, no ‘How do I install a gem’ section, etc.). Why did you choose to go this route? Assaf There are books that teach you Ruby, I personally recommend the Pickaxe , I don’t think we need another one. For a lot of people, I happen to be one of them, the first obstacle is not learning the language itself, but learning to use the language to solve specific problems. It’s easier to learn Ruby and be productive when you’re seeing examples for real life problems, like generating a report, or parsing an XML document, or using a Web service, so that’s the approach we took with Ruby In Practice. Jeremy It was really at RailsConf that I think we decided to pull a lot of the introductory stuff we had in there. We had a lot of “learning Rails” type stuff with some introductory Ruby coddling, but I was really struck at RailsConf how many Ruby books I saw at the book store at the conference and later at the mall. I usually keep pretty on top of the book market, and there were 3-4 that I’d never heard of. The market was finally robust, and so I saw no need to duplicate effort. 2) No book can cover everything. What are some Ruby things you wanted to talk about but just couldn’t fit into the book? Jeremy We originally covered a lot more of the “why” for Ruby, but after reviews and actually reading what we wrote (haha! novel!) we decided that it didn’t fit. This is a manual designed mostly for developers, architects, or hybrids thereof, so we wanted to make sure that’s who we focused on. I, personally, would also like to spend more time on the Ruby language, but this is a “practical” manual rather than a “language” manual so it didn’t really fit. Assaf You can write an entire book on XML processing with Ruby, or Web services, or Ruports and PDF::Writer. The hard part is picking a handful of examples to show basic usage and more advance techniques, and fitting that into a single chapter. Besides covering all the different ways you can use a given library, there’s also a few things we won’t be able to fit into the book, but can’t list those until we’re done with the book. 3) In your first chapter you run through some of the Ruby idioms and features that really make the language shine. Where would you recommend readers go who feel that they need more information on these topics? Assaf Have a look at other people’s code. When I started with Ruby, a lot of the concepts like writing a DSL or using method_missing were abstract. It was interesting to learn, but it only became practical when I looked at other people’s code and learned by example how, when and why to use them. And thankfully, Ruby has a lot of open source code you can look at, and your options range from Rails (a lot of good ideas in the code) to blogs that deal with one specific use case at a time. Jeremy The Ruby Way and Ruby For Rails . Hal’s book is a given, but David’s chapter on the dynamic features of Ruby is top notch in my opinion. I still feel like there’s a gap in “advanced” Ruby knowledge to fill, and I hope to be involved in a project that fills it in the future (but we’ll see). 4) In Chapter 2, you guys provide the first coverage of RSpec and Heckle that I remember seeing in a Ruby book. Why did you choose to cover them alongside test::unit? Assaf Testing is about specifying how the code should work, and then making sure it behaves that way. Rinse, repeat. You want to express tests in the most natural way, and RSpec does just that. But RSpec comes from the ability to have open classes and extend objects which works for Ruby; in languages like Java and C++ you don’t have that capability, so the best you can do is write assert statements. Assert statements are not the way to write tests, they’re just a compromise made by the limits of the language. Still a lot of people move between Ruby and other languages and already know the xUnit way of testing, so it makes sense to teach both at the same time. Jeremy More and more I’m finding that people know Ruby, but don’t test. The paradigm doesn’t make sense to them: why am I asserting things about code that doesn’t exist yet? The BDD paradigm makes more sense: you’re defining behavior, discussing things that “should” happen, and so on. So, I think for those coming to the book with knowledge of Ruby but aren’t testing yet, covering RSpec might be a breath of fresh air. As for Heckle, I’m finding that even in my own code, my tests are weak. Since I’ve been heckling, I start thinking a lot more carefully when testing. We included the section on heckle primarily because it’s such a darned useful tool for rooting out bad tests! 5) I also enjoyed Chapter 3’s discussion of integration. It seemed to have a lot less code than I would have expected, but I think it covered integration better because of that. What prompted you to write the chapter the way that you did? Will we see more of this kind of writing in future chapters? Jeremy One reason was that a lot of these systems have a lot of code running in them (most of it code that can’t be released publicly…), but also we wanted to setup the rest of the book. The main thrust of the chapter is that you take ideas from it and then apply it to the technologies we teach you in the book. We give you some strategies you can enact combined with the practical content later on to solve some pretty big problems. 6) Chapter 4 continues to take a different perspective on things with it’s coverage of Rails. I really would have liked to see some coverage of Merb as an alternative to Rails … Any chance something like that might show up the book’s blog? What kinds of things do you plan on writing on the blog? Assaf Think 80/20. We can’t possibly cover everything in a single book, so some things are unfortunately left out, but hopefully we’ll give people enough taste of Ruby that they’ll go out and experiment with more Ruby libraries, beyond those we could cover. 7) Anything else that you guys would like to say to prospective readers? Jeremy Enjoy. Enjoy life, enjoy Ruby, enjoy the book, and please enjoy giving us some feedback on the author forum so this book rocks that much harder when it comes out. Oh, and write tests, Haskell, YAGNI, Agile, SCRUM, spec, Rails, Web 2.0. I just wanted to make sure that this answer at least had something to do with software development. Assaf Write a lot of tests, have a look at RSpec and RBehave, they make test writing fun which is the most important feature in a testing framework. Learn not just the language, but the whole philosophy behind Ruby; you’ll get much more from keeping your code simple and DRY, avoiding premature abstractions and YAGNI, than any programming technique or feature. Don’t be afraid to scale out, and don’t be afraid to use the command line and mix languages. Let’s take a look at section 1.1.6, the goal of this section is to look at conditional expressions through implementing an absolute value procedure. the book iterates through a couple of versions, trimming away fat. In each of my examples below, I’ve only shown the final product. Esercise 1.3 asks the reader to write a procedure that takes three numbers and returns the sum of the squares of the largest two of them. In each case below, I rely on the previously defined square and sum-of-squares (sum_of_squares) procedures. qsort([X || X <- T, X >= Pivot]). lists:sum([square(A) || A <- L]). The biggest thing I’ve taken away from this exercise so far is that I really need a good Factor book that covers both the language and the vocabulary. Along similar lines, Programming Erlang is a good book, but it could have spent some more time on basic programming (especially covering the provided functions in something other than an appendix). Factor has been the language that’s been hardest to wrap my mind around so far. At the same time, it’s the one that I’ve enjoyed the most—I also think the word definitions have a sort of terse beauty. I think Ruby is probably the one that most programmers could just pick up and maintain though. Next up, Section 1.1.7 “Square Roots By Newton’s Method”. With Ola Bini’s JRuby book out, I thought that I should take some time to talk to him about it. Read on to see what Ola has to say about JRuby, JRuby books, and other languages. You’ve written the first JRuby book. Obviously, it couldn’t cover everything, so what JRuby books are you hoping to see come out over the next year or so? Books and language penetration are kind of a chicken and egg thing. What’s your impression of JRuby’s ‘real world’ use? Ola This is a very hard question to answer. The interest in JRuby have picked up immensely the last few months though—after the 1.0 release more and more people have been streaming in to the community. Also, we’re seeing more companies that are working on applications using JRuby (both within ThoughtWorks and at other places). How do you think your book will help? I think it will make a fair improvement. As soon as a book on a subject comes out, the subject usually gains more penetration—so I’m positive. 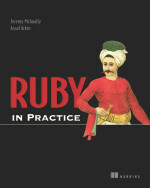 Your book is mostly focused on Java users who will be picking up JRuby. How will it work for Rubyists going the other direction? Ola Rubyists will be able to get going much quicker - since JRuby on Rails is Ruby on Rails this means that the initial hurdle is very small if you know Ruby and Rails. But there are still lots of things to learn for the Rubyist - including lots of things that are JRuby specific. Also, seeing the things you can accomplish by combining Ruby and Java will hopefully open the eyes of many Rubyists to exciting possibilities. What do you wish you could have covered (or covered better) in your book? Ola That’s a good question. I’m pretty happy about the current scope, but if I could have put some more information in about deployment that would have been good. There is popping up new ways of doing it all the time with JRuby, and the subject needs coverage. That said, I cover it fairly well, but there are always more things to say about a subject like that. What Rubyisms are going to make the biggest positive difference in the Java world because of JRuby? Ola Just getting the message out there about a more functional approach, making good use of internal iterators and closures would make much Java code better too. Also, just seeing that there are valid alternatives to the XML centric Java way of doing things is very important. What Javaisms are going to make the biggest positive difference in the Ruby world because of JRuby? Ola Depends on what you mean by Javaisms. I don’t think the Java language has much to teach Ruby. On the other hand, Ruby will benefit immensely from the rock solid virtual machine, many of the management features of Java, and lots and lots of different things that the Java ecosystem does correctly. Outside of Java and (J)Ruby what three languages do you think programmers should learn to round out their programming knowledge? Ola Three languages that rounds out your knowledge is kinda interesting. It doesn’t matter that much which languages you choose—the important thing is that they embody totally different paradigms. I would recommend learning Common Lisp (for the LISP way of doing things, functional programming, macros, and a totally different Object System (CLOS)). Prolog also deserves mention as a good language to learn. The declarative style of programming twists your mind totally differently than functional or imperative programming, and the declarative style is also seeing a resurgence in domain specific languages. The third language should be OCaML – to see what real static typing is about. Also gives insight into other domains of functional programming, some pattern matching and other nice features. Here’s my cut at SICP 1.1.4 in Factor. I’m a lot less sure of this than I am of the Ruby translation since I’m learning Factor as I go along. I’d appreciate comments from the Factor community as I go along, especially about Factor idioms. In my Ruby translation, I failed to talk about some things, like procedures in SICP being methods in Ruby, and changing the method names to match the snake_case style favored by Rubyists. In the factor translation, procedures would be referred to as words, but I’ll be keeping the lispy-lowercase-divided-by-hyphens look. There’s already a sq word in Factor, and I based my definition on that one. > 3 4 sum-of-squares . 1 In trying to create sum-of-squares, I ran into an initial problem understanding word definition. Thanks to gnomon in #concatenative for his help in straightening me out. Further updates are a result of the kind folks on #concatenative reading this and correcting me. Recently, I posted about reading and working through SICP in languages other than scheme. Today is the day that I start. I don’t know how quickly I’ll work through things, but we’ll see what I can do. In addition to Ruby, I’m also hoping to work with Factor and Erlang in parallel. My first SICP post is nice and easy, I’m skipping up to Section 1.1.4 of SICP which covers compound procedures (procedures made up of other procedures). This is really the heart of concatenative programming (like forth and factor) and of the style of short method OO espoused be Martin Fowler in Refactoring .